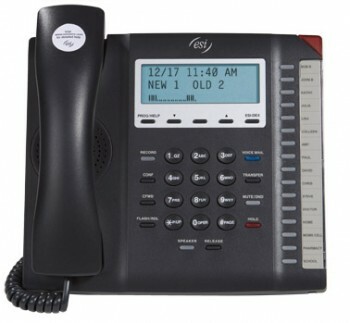 Two new business phone models released | Telco Ltd. 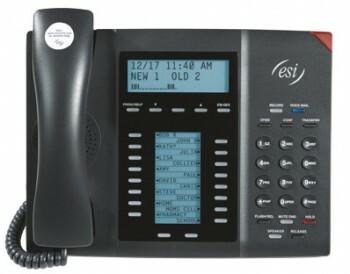 The ESI 40 Business Phone features a modern design, backlit display for high visibility, 16 programmable buttons, and a number of fixed feature buttons: Voice Mail, Transfer, Mute/DND, Hold, Record, Conference, Call Forward, Flash/Redial, Speaker, Release, Program/Help, and ESI-Dex (which accesses a built-in list of personal, system, and location speed dials). The ESI 40 can be ordered in either a digital version or IP (10/100) version. As with all ESI phones, these two phones are very solidly built–you can really tell the difference when you put them side-by-side with many other manufacturers’ phones (a lot of phones out there, especially IP phones, almost feel like toys because they’re made so cheaply; this may be fine for residential users, but it surprises me how many business IP phones out there are so flimsy and un-ergonomic). Both phones are compatible with ESI’s VIP computer telephony software. I had a chance to test out the ESI 60 IP phone, and was very favorably impressed. The main thing I noticed was the superb audio quality, which I assume has to do with the full duplex/high definition aspect of the phone. I also liked the Visual Voice Mail a lot. Visual Voice Mail uses the bottom display when you are in your voice mail. It displays up to 8 voice mails at a time and you can see the Caller ID and when the message was left; thus, you can prioritize and choose in which order to play back the messages. Neat! If you have more than 8 voice mails, you can easily press a button to move through “pages” of additional 8 voice mails.